文力, 魏鹏飞, 常华进, 孙小舟, 李权国, 杜红旺, 刘琛, 李学敏, 秦玉莉. 青藏高原周边地区河流分形特征与地貌、构造活动耦合关系[J]. 地质通报, 2018, 37(6): 965-974. 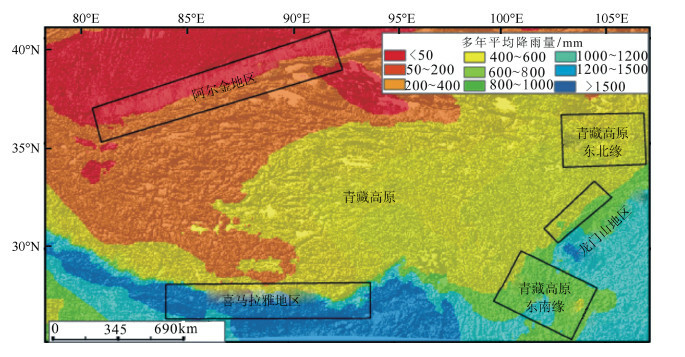 Wen Li, Wei P F, Chang H J, Sun X Z, Li Q G, Du H W, Liu C, Li X M, Qin Y L. A study of the coupling relationship be-tween fractal characteristics of river, geomorphology and tectonic activity in areas around the Tibetan Plateau[J]. Geological Bulletin of China, 2018, 37(6): 965-974. Abstract: The research on the geomorphological characteristics and the mechanism of the formation and evolution in areas around the Tibetan Plateau has been a hot issue in recent years. 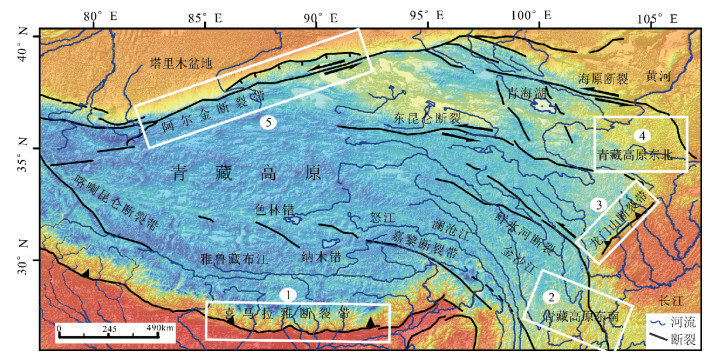 In this paper, the authors studied the fractal characteristics of the river net-work, geomorphic features and tectonic activity in areas around the Tibetan Plateau. There are strong tectonic activities, frequently strong historical earthquakes, many large earthquakes in the Himalaya fault zone, Longmenshan Mountain fault zone and Altun fault zone, and there are many similarities in river pattern characteristics and geomorphic evolution, such as quick changes of the longitudi-nal profile and concave shape with long wavelength, steep stream gradient ratio, high relief, simple river pattern and low fractal dimen-sion of river. Tectonic activities are not strong on the northeastern margin of the Tibetan Plateau as compared with features of the Hi-malaya fault zone in this aspect, as shown by rare strong historical earthquakes, slow changes of the longitudinal profile and convex shape with long wavelength and micro-amplitude, slow stream gradient ratio, small relief, complex river pattern and high fractal di-mension of river. There are strong tectonic activities, frequent strong historical earthquakes, many large earthquakes on the southeast-ern margin of the Tibetan Plateau, but because the regional average annual erosion rate is very low, and stream trenching is very deep, the change of the longitudinal profile is slow, its shape is convex with long wavelength and micro-amplitude, the stream gradi-ent ratio is slow, the river pattern is complex, and the fractal dimension of the river is high. The authors hold that the regional erosion rate is much more controlled by the tectonic activity than by the precipitation, and therefore the influence of the spatial variation of precipitation can be largely ignored in the analysis of river pattern characteristics. 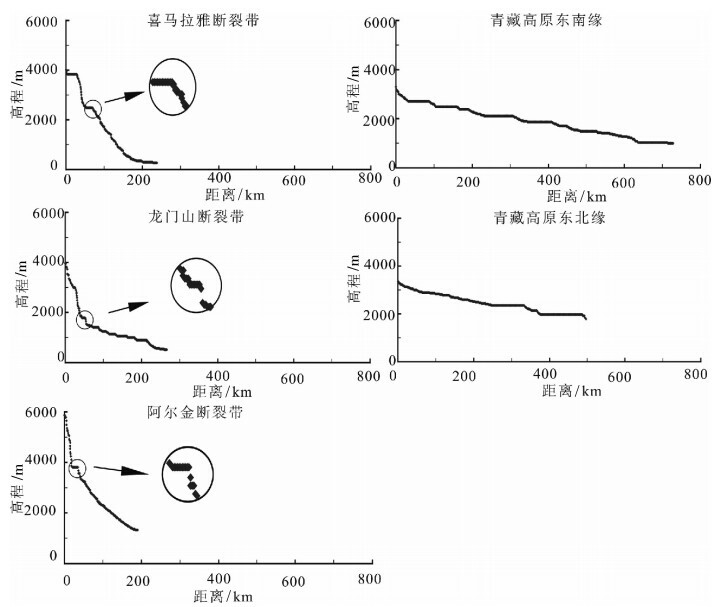 Molnar P, Tapponnier P. Cenozoic teconics of Asia:effect of conti-nental collision[J]. Science, 1975, 189: 419–426. DOI:10.1126/science.189.4201.419. 钟大赉, 丁林. 青藏高原隆升过程及其机制的探讨[J]. 中国科学(D辑), 1996, 26(4): 289–295. Royden L H, Burchfiel B C, King R W, et al. Surface deformation and lower crustal flow in eastern Tibet[J]. Science, 1997, 276: 788–790. DOI:10.1126/science.276.5313.788. 李吉均, 方小敏. 青藏高原隆起与环境变化研究[J]. 科学通报, 1998, 43(15): 1569–1574. DOI:10.3321/j.issn:0023-074X.1998.15.001. Clark M K, Royden L H. Topographic ooze:Building the eastern margin of Tibet by lower crustal flow[J]. Geology, 2000, 28: 703–706. DOI:10.1130/0091-7613(2000)28<703:TOBTEM>2.0.CO;2. Tapponnier P, Xu Z Q, Roger F, et al. 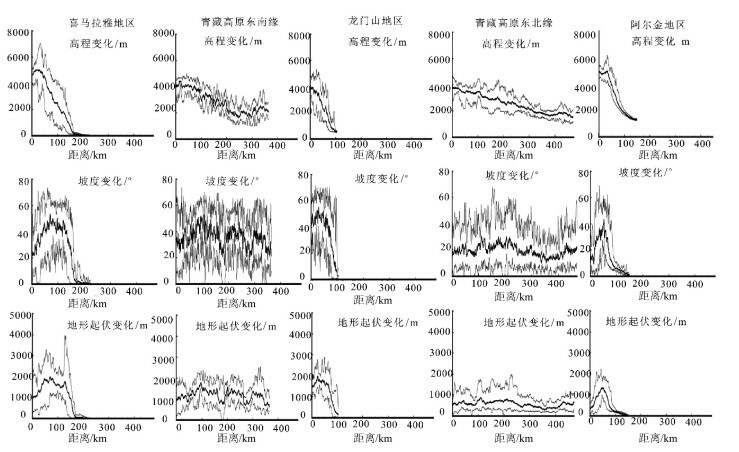 Oblique stepwise rise and growth of the Tibetan plateau[J]. Science, 2001, 294: 1671–1677. DOI:10.1126/science.105978. Burchfiel B C, Wang E C. Northwest-trending, middle Cenozoic, left-lateral faults in southern Yunnan, China, and their tectonic sig-nificance[J]. Journal of Structural Geology, 2003, 25: 781–792. DOI:10.1016/S0191-8141(02)00065-2. Clark M K, House M A, Royden L H, et al. Late Cenozoic uplift of southeastern Tibet[J]. Geology, 2005, 33: 525–528. DOI:10.1130/G21265.1. Shen Z K, Lu J N, Wang M, et al. Contemporary crustal deforma-tion around the southeast borderland of the Tibetan Plateau[J]. Jour-nal of Geophysical Research-Solid Earth, 2005, 110(11): 1–17. 李海兵, 杨经绥, 许志琴, 等. 阿尔金断裂带对青藏高原北部生长、隆升的制约[J]. 地学前缘, 2006, 13(4): 59–80. 秦耀辰, 刘凯. 分形理论在地理学中的应用研究进展[J]. 地理科学进展, 2003, 22(4): 426–436. DOI:10.11820/dlkxjz.2003.04.011. 艾南山, 陈嵘. 走向分形地貌学[J]. 地理学与国土研究, 1999, 15(1): 92–96. 艾南山, 李后强. 从曼德尔布罗特景观到分形地貌学[J]. 地理学与国土研究, 1993, 16(1): 13–17. 艾南山, 朱治军, 李后强. 外营力作用随机特性和分形布朗地貌的稳定性[J]. 地理研究, 1998, 17(1): 23–29. 沈晓华, 邹乐君, 阳峰, 等. 长江河道分形与流域构造特征的关系[J]. 浙江大学学报(理学版), 2001, 28(1): 107–111. 石峰, 何宏林, Densmore A L, 等. 二维分形参数与构造活动关系研究——以滇西南块体为例[J]. 地震地质, 2016, 38(4): 862–873. 刘传正. 活动断裂系统的分段性及其分形几何特征[J]. 水文地质工程地质, 1993(6): 16–19. 谭凯旋, 郝新才, 戴塔根. 中国断裂构造的分形特征及其大地构造意义[J]. 大地构造与成矿学, 1998(1): 17–20. 文力, 刘静, M Oskin, 等. 活动构造对高原边界侵蚀速率空间分布的控制作用; 以龙门山地区为例[J]. 第四纪研究, 2012, 32(5): 968–985. Liuzeng J, Tapponnier P, Gaudemer Y, et al. Quantifying land-scape differences across the Tibetan plateau:Implications for topo-graphic relief evolution[J]. Journal of Geophysical Research-Earth Surface, 2008, 113(F4): F04018. DOI:10.1029/2007JF000897. 王林, 陈兴伟. 基于DEM的流域水系分维计算与结果分析[J]. 地球信息科学, 2007, 9(4): 133–137. Horton R E. Erosional development of streams and their drainage basins; hydrophysical approach to quantitative morphology[J]. Jour-nal of the Japanese Forestry Society, 1945, 56(3): 275–370. 沈玉昌, 龚国元. 河流地貌学概论[M]. 北京: 科学出版社, 1986. Mandelbrot B B. The fractal geometry of nature[M]. New York: WH Freeman and Company, 1983. Mesa O J, Gupta V K. On the main channel length-area relation-ship for channel networks[J]. Water Resource Research, 1987, 23(11): 2119–2122. DOI:10.1029/WR023i011p02119. 冯平, 冯焱. 河流形态特征的分维计算方法[J]. 地理学报, 1997, 52(4): 324–330. 贾绍凤. 构造运动影响河流纵剖面及河道冲淤的数学模型[J]. 地理学报, 1994, 49(4): 324–331. 陆中臣, 周金星, 陈浩. 黄河下游河床纵剖面形态及其地文学意义[J]. 地理研究, 2003, 22(1): 30–38. 张会平, 杨农, 张岳桥, 等. 岷江水系流域地貌特征及其构造指示意义[J]. 第四纪研究, 2006, 26(1): 126–135. 张会平, 张培震, 吴庆龙, 等. 循化-贵德地区黄河水系河流纵剖面形态特征及其构造意义[J]. 第四纪研究, 2008, 28(2): 299–310. 赵洪壮, 李有利, 杨景春, 等. 天山北麓河流纵剖面与基岩侵蚀模型特征分析[J]. 地理学报, 2009, 64(5): 563–570. DOI:10.11821/xb200905005. 阚瑷珂, 朱利东, 龚建辉, 等. 基于ArcView的带状剖面工具开发及在地貌分析中的应用[J]. 成都理工大学学报(自然科学版), 2006, 33(1): 64–69. Clark M K, Royden L H, Whipple K X, et al. Use of a regional, relict landscape to measure vertical deformation of the eastern Ti-betan Plateau[J]. Journal of Geophysical Research-Earth Surface, 2006, 111(F3): 338–345. Clark S J P, Dempster T J. The record of tectonic denudation and erosion in an emerging orogen:an apatite fission-track study of the Sierra Nevada, southern Spain[J]. Journal of the Geological Society, 2009, 166: 87–100. DOI:10.1144/0016-76492008-041. Chappell J, Zheng H B, Fifield K. Yangtse River sediments and erosion rates from source to sink traced with cosmogenic Be-10:Sediments from major rivers[J]. Palaeogeography, Palaeoclimatolo-gy, Palaeoecology, 2006, 241: 79–94. DOI:10.1016/j.palaeo.2006.06.010. Whipple K X, Tucker G E. Dynamics of the stream-power river incision model:Implications for height limits of mountain ranges, landscape response timescales, and research needs[J]. Journal of Geo-physical Research-Earth Surface, 1999, 104: 17661–17674. DOI:10.1029/1999JB900120. Galy A, France-lanord C. Higher erosion rates in the Himalaya:Geochemical constraints on riverine fluxes[J]. Geology, 2001, 29: 23–26. DOI:10.1130/0091-7613(2001)029<0023:HERITH>2.0.CO;2. Garzanti E, Vezzoli G, Ando S, et al. Quantifying sand provenance and erosion (Marsyandi River, Nepal Himalaya)[J]. Earth and Plane-tary Science Letters, 2007, 258: 500–515. DOI:10.1016/j.epsl.2007.04.010. Kirby E, Reiners P W, Krol M A, et al. Late Cenozoic evolution of the eastern margin of the Tibetan Plateau:inferences from 40Ar/39Ar and U-Th/He thermochronology[J]. Tectonics, 2002, 21(1): 1–20. Kirby E, Whipple K X, Tang W, et al. Distribution of active rock uplift along the eastern margin of the Tibetan Plateau:infer-ences from bedrock channel longitudinal profiles[J]. Journal of Geophysical Research, 2003, 108(B4): 215–231. Godard V, Pik R, Lavé J, et al. 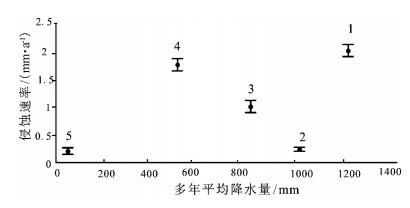 Late Cenozoic evolution of the Central Longmen Shan (Eastern Tibet), insight from (U-Th)/He thermochronometry[J]. Tectonics, 2009, 28: TC5009.